Not Feeling Well | Teefa Says.. Finally i get to blog! Still no Streamyx connection at home cause apparently TM is installing high speed wire thingy in my area. Pchfttttt! Anyway, i got sick last Thursday. Sick with utterly crazy diarrhea! i went to work fine that morning. Then i had serious pain in the abdomen. The usus-tersimpul-berpusing2-filled-with-acid kind of pain. Followed by 4 times visit to the loo...in one hour time! Then i went to the doctor (dengan bersusah-payahnya.. i swear i walked like a lady about to give birth) and got a shot! My poor arm got shot by the doctor. Perot yang sakit, tangan kene cucuk! Mr. Chenta: Are you out of your mind? Baru cirit-birit sekali dah kene colon cancer? Drama queen lah you! 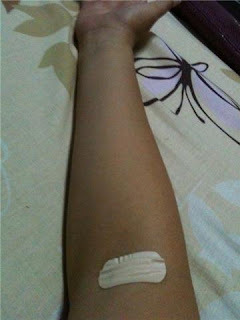 Anyway, the diarrhea was gone by 6pm but only to be replaced with fever. This time i was convinced i have H1N1. Thankfully after taking some meds, the fever's gone. Then i got a why-are-you-paranoid-it's-just-diarrhea-and-normal-fever-don't-say-bad-things-nanti-betul-jadi-baru-tau lecture from Mr. Chenta. Adoiii..